A Team 10 investigation discovered problem homes in neighborhoods across San Diego. SAN DIEGO (KGTV) - The City of San Diego is home to hundreds of potential hoarding cases, according to complaints sent to the city’s Development Services department. In some cases, the homeowners don't care. In others, things might have just gotten out of hand. “I’ve been working on it, but I’m not working on it fast enough,” one homeowner told 10News. In 2018, San Diego saw its share of house fires in which junk overran the houses or surrounding yards. "If you have a house that has that significant fuel load or is just packed in, well now for the firefighters going in it's like they are crawling through a tunnel,” Deputy Fire Chief Steven Lozano told 10News. Lozano said those types of situations can be dangerous for crews and surrounding homes. Those type of fires seemed to be happening so often that it caught our attention. Crews on the ground and neighbors kept saying the word "hoarding." Using the City of San Diego’s code enforcement records, Team 10 analyzed all complaints with the word “hoard” dating back to 2015. We found hundreds of complaints that appeared to describe a potential problem, identifying packed houses, front and back yards filled with household items, trash bags, and furniture. 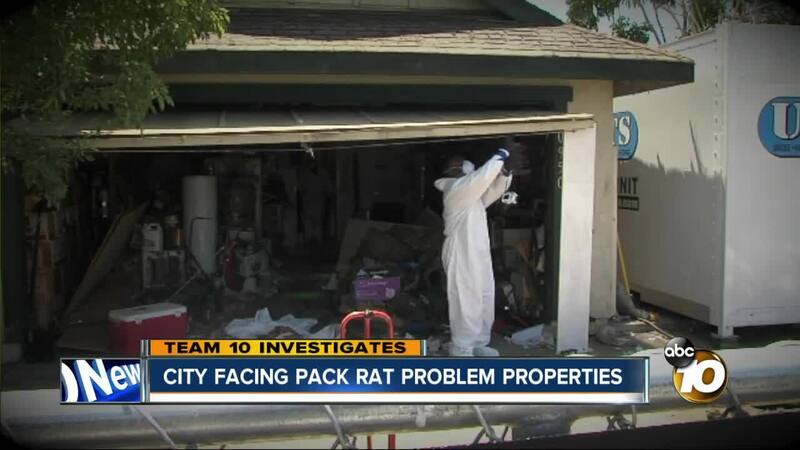 10News is using the word "potential" because some cluttered properties are just problems, while in others, the people living there may suffer from hoarding disorder. “Hoarding disorder is a chronic problem,” said Dr. Sanjaya Saxena, the director of the obsessive-compulsive disorders clinic at UC San Diego Health. Hoarding disorder is present in about three to four percent of the population and can start when someone is around 13 years old, he said. The disorder also runs in families. It doesn't seem to be something that’s learned, but it can be brought on by environmental factors, Saxena explained. "The first symptoms are urges to save, a strong perceived need to hang on to items that most people would have thrown out, difficulty discarding, emotional distress with discarding, the excessive acquisition,” Saxena said. He said the clutter seen in severe cases of hoarding doesn't typically happen until later in life. Most of the time, those involved need help, which can come through therapy, medication or both. "So the person can actually learn that it's OK; they can discard a lot of that stuff and it's OK," Saxena said. The extreme end of the disorder can pose risks-- not just to the person suffering the disorder, but to neighbors, too. "What we're worried about are the neighbors, their health and their safety, the person who's living here, whether the home has become a nuisance,” said San Diego City Attorney Mara Elliott. When problem properties, no matter what the reason, start to affect a San Diegan’s life, the City Attorney's office can and does step in. If the case goes to court, a judge can put an independent receiver in place to manage the property. "With that court order I take control of a property and am ordered by the court to remedy all violations at the property and get the property back into compliance, so it's safe for the neighborhood,” said receiver Red Griswold of Griswold Law. A receiver like Griswold works with the property owner to make changes. The owner still has the title, but the receiver is in charge. It's the city's last-resort option to protect the neighborhood and the person in the home, but getting to that point can take years and dozens of complaints. The City Attorney’s office said that in hoarding cases, it works with other agencies to address health, safety and nuisance issues while ensuring that the hoarder gets appropriate help from social service agencies and mental health professionals. If you know someone who may be suffering from hoarding disorder, Saxena recommends getting them help. The San Diego Hoarding Collaborative, a group of mental health and community professionals, created a resource guide to help families. You can also call 619-543-6904. Anyone who wishes to report code, health and safety and environmental violations can contact the City Attorney's Nuisance Abatement Unit at 619-533-5655.